If you don't have the time or money for aerobic and resistance training, why not try climbing the stairs? 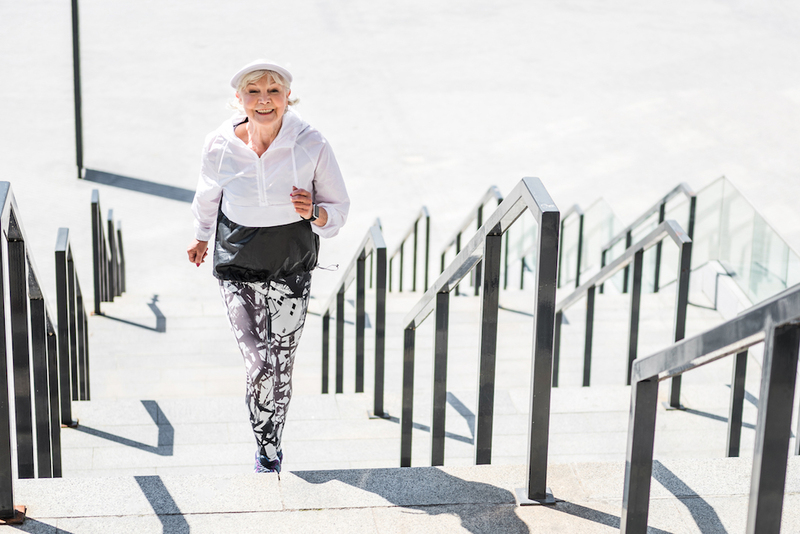 A new study demonstrates that stair climbing not only lowers blood pressure but also builds leg strength, especially in postmenopausal women with estrogen deficiencies who are more susceptible to vascular and muscle problems. In the article "The effects of stair climbing on arterial stiffness, blood pressure, and leg strength in postmenopausal women with stage 2 hypertension," results are provided from a study involving Korean postmenopausal women who trained four days a week, climbing 192 steps two to five times a day. The study concluded that stair climbing led to reductions in arterial stiffness and blood pressure and increases in leg strength in stage 2 hypertensive postmenopausal women. "This study demonstrates how simple lifestyle interventions such as stair climbing can be effective in preventing or reducing the negative effects of menopause and age on the vascular system and leg muscles of postmenopausal women with hypertension," says Dr. JoAnn Pinkerton, NAMS executive director.